Beneath contempt: what other way is there of describing the events of the last few days at Visoko? As can be seen here, during the night of 6th-7th of August, the excavations of the mediaeval fortress of Visoki, at the top of the hill of Visocica, which Mr. Osmanagic persists in describing as “the highest pyramid in the world”, were subjected to criminal vandalism. It was the second such attack suffered by the fortress; during the Autumn of 2007, these vandals, or others of the same ilk, had already damaged part of the walls revealed during the excavation. The attack perpetrated last week, which was much more serious than the damage caused in 2007, has caused huge consternation in Visoko and elsewhere, as well as generating almost universal condemnation in Bosnian scientific and political circles. In contrast, this makes the reaction of certain individuals directly or indirectly connected with the pseudo-archaeological “Bosnian pyramids” project all the more scandalous. Let’s start with Mr. Senad Hodovic, Director of the Museum of Visoko, and formerly a member of the Osmanagic team. Although he condemned the vandalism and called for action to be taken against the perpetrators, his overriding concern was that, to his great annoyance, expressed in this press interview (bs), he was not kept directly informed by the site archaeologists; he complained that he had only learnt of the Visoki incident on 7th August from journalists. In the days following the incident, he launched multiple attacks (bs) on his colleagues at the Museum of Sarajevo, in particular Mirsad Sijaric, accusing them of holding back information and behaving unprofessionally. Without actually calling into question the theory that this really was an act of vandalism, he even went so far as to imply that those responsible for the damage were the archaeologists themselves, who supposedly used sub-standard excavation techniques and failed to protect the excavations properly. It seems that, as far as Mr. Hodovic is concerned, this episode is just one more in the “war” that he has been waging for years against the Museum of Sarajevo, his support for Sarajevo archaeologists encroaching on “his” territory being notable for its complete absence. Echoes of this conflict can be found in this online article from the Center for Investigative Reporting (en) about Bosnia and Herzegovinia’s “archeological treasure [being] neglected”. 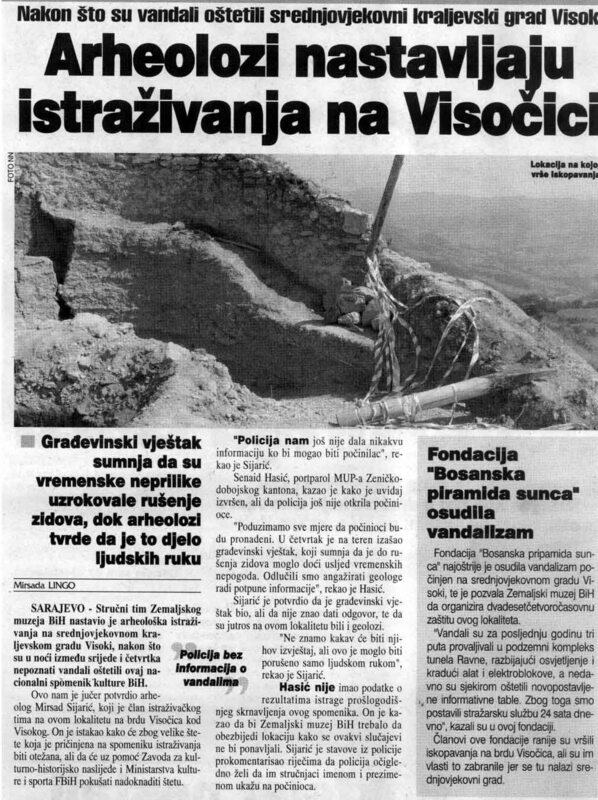 The article explains how the Museum of Visoko, in the person of its Director, Mr. Hodovic, was annoyed at its lack of involvement in the excavations at the Neolithic site of Okoliste (de) near Visoko. These excavations got underway in 2002-2003, under the direction of a German-Bosnian team directed by Johannes Müller of the University of Kiel and Zilka Kujundzic-Vejzagic from the National Museum of Sarajevo. The fact that the German archaeologists chose to go into partnership with the Museum of Sarajevo rather than with the Museum of Visoko is hardly surprising; the latter is a small local museum with no archaeologists attached to it (Mr. Hodovic himself is a former teacher of Marxism, and neither an historian nor an archaeologist). However, that didn’t prevent Mr. Hodovic from calling on the authorities of the canton of Zenica-Doboj to halt the excavations, even though they had received federal authorisation. The article by the Center for Investigative Reporting does not reveal how the matter finished, but the timescale of the Okoliste excavation seems to demonstrate fairly conclusively that, during the years that followed, there were no further excavations in the area apart from geophysical investigations. Work in the area only resumed in 2006, still under the direction of Mr. Müller and Mrs. Kujundzic-Vejzagic, although this time in official partnership with the Museum of Visoko. This report is a good illustration of the difficulties and obstacles facing archaeologists because of the political structure that is a legacy of the Dayton Peace Accords (conflicting cantonal, federal, and even national, laws and decisions), a subject mentioned previously when discussing the excavation permits granted to Mr. Osmanagic. The story also throws particular light on the personality of Mr. Hodovic, who could be described as wanting to control anything and everything to do with the history and culture of Visoko. This preoccupation was also illustrated by the manner in which he was always in a rush to be the first to announce (bs) this or that discovery at Visoki. Clearly, when it comes to a question of sidelining his “rivals” from Sarajevo, Mr. Hodovic doesn’t mind what means he uses to achieve his ends, and that includes using the damage at the fortress to question their professional competence. In various interviews with, or articles about, members or friends of Mr. Osmanagic’s Foundation during the last few days, the theme of the alleged incompetence of the team from the Museum of Sarajevo has kept raising its head. First to open fire was Mr. Goran Cakic, who, after making what was presumably an attempt to ingratiate himself with the team of professional archaeologists when he claimed to have excavated the site of Visoki (bs) in 1976 in company with Pavao Andelic, "innocently" asked: “Was the work at the old town of Visoki conducted professionally?” (bs). His article implies that the Sarajevo archaeologists had made mistakes and effectively destabilised the structures. In his conclusion, he goes further even than Hodovic; he says that there is no need to suggest that vandalism was to blame for the wrecked site, as the damage could have been caused only by the effects of sudden inclement weather on structures that had been neither properly excavated nor adequately stabilized. Coming as it does from a former textile engineer, and one of the foremost movers and shakers of Mr. Osmanagic’s “excavations”, about which the very least that can be said is that they were certainly never conducted in any very professional manner, this is absolutely priceless. Still, the idea has been taken up by journalists close to the Foundation, who are getting their claws into the archaeologist Mr. Sijaric (bs) plugging away with the theory that this was a case of naturally occurring damage that Mr. Sijaric had been trying to disguise as vandalism (bs) in order to conceal his own incompetence. One is really driven to wonder whether Bosnian is actually Mr. Djurdjevic’s native language; I cannot imagine that he could intentionally have produced these mistranslations... unless he is in training to become what Mr. Osmanagic’s Foundation calls "an objective and unbiased journalist"!